Rather than X-Factor judges or contestants making entertainment headlines, presenter Olly Murs is the talk of the town today. On last night's episode, Murs accidentally reveals the person being eliminated a bit too soon. After singers Monica Michael and Anton Stephans had a sing off, the four judges were equally split as to who they wanted to send home. This meant it was a “deadlock” and up to the public to vote for who they wanted to save. 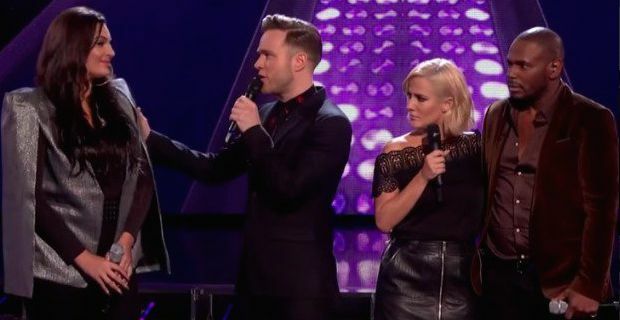 Murs then proceeds to tell Monica she was eliminated but then was corrected by co-host Caroline Flack who said, “No Olly, she’s not." The envelope containing the official results hadn’t been given to them yet. When the results did come in, Monica did end up being eliminated along with contestant Max Stone on last night's show. Olly has apologized both on and off screen. On stage he apologized to the contestant saying, “Sorry I do apologise, sorry Monica, that’s my fault.” He then tweeted, “I apologise to everyone tonight I have made a massive f*** up at the end. It was so tense!!! I’m still learning & hope that never happens again." Many X-Factor fans have taken to Twitter both with positive and negative comments. While some people like Tony Rakhra state, “The next person leaving X-Factor is Olly Murs #deadlock” others such as preveious X-Factor presenter Dermot O’Leary tweeted, ”Hey @ollyofficial Ahoy my friend. Keep that head up. Happens to us all. X “ An X-Factor spokesman also stated, “As Olly has said himself on Twitter, it was a genuine mistake."